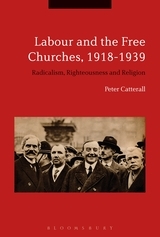 As Peter Catterall notes in the introduction to this important book, the existence of an intimate relationship between the Labour party and the Free Churches was once axiomatic: in the immediate post-war period it was commonplace in the general understanding of the party’s history that, as one secretary of the party noted, Labour owed more to Methodism than Marx. The connection was also articulated by Alan Bullock in 1960, but has become occluded in subsequent historical writing. Catterall’s aim is to examine the relationship afresh, in which he succeeds splendidly. The book will be required reading for anyone interested in the relationship of faith and politics between the wars. As a distinguished scholar of both British political history and of the Free Churches, Catterall is well placed to examine the relationship between the two, having already made important contributions to the parallel story in the Conservative party. Here his case is unfolded carefully and in detail, resisting the lure of easy simplification, and though difficult to summarise adequately in the small space available here, it richly repays a patient and attentive reading. It is a relatively uncommon form of historical writing: the comparitive history of two institutions, quite distinct from each other but both with claims to make in the national conversation about the common good and the means of achieving it. As such it blends intellectual, political, social and economic history, and successfully at that. Chapters 4 and 5 concentrate in particular on the sociology of Labour and the Nonconformists, as voters, in local government, in the trade unions, and in Parliament. A complex electoral picture emerges, as Labour gained some Nonconformist votes that previously went to the Liberal party almost as of right, whilst Stanley Baldwin’s Conservatives captured the support of others. However, Nonconformists were disproportionately represented in local government, as union officials and as Parliamentary candidates. Catterall convincingly attributes this to the unique opportunities that the chapels provided for the working man: to debate ethics, to organise and to preach. A generation of men emerged that were recognised for their drive, their skills as speakers and as organisers, and for their honesty. Even though by 1939 the numbers had fallen, the effect was still significant. Perhaps of particular interest to readers of this journal is Catterall’s interpretation of the theological and moral trajectories taken by both the churches and the party. Catterall shows that the ‘Nonconformist conscience’ took a complex and interesting turn in the interwar years (chapters 2 and 6). At least some Nonconformists remained exercised by the traditional causes of temperance, gambling and the Sabbath, and individual voices within Labour continued to promote them. But the tone was tempered by a growing realisation that these were not simply individual moral failings but part of a complex interaction of economics and politics, and the effects of war. Issues such as unemployment were no longer seen as the product of individual sinfulness and vested interest, but the imperfect workings of a impersonal system. Within Labour, whilst those individual voices were present and largely took over a role played before by Liberal MPs, the legacy of the Nonconformist conscience was not at the level of specific policy but in a certainty and a righteous of tone: the rhetorical deployment of an ethic of the New Testament without its soteriology (chapter 6). Labour MP George Thomas referred to a ‘feeling of crusade’ amongst some of the MPs of the Attlee government (p.154). Chapters 1 and 8 demonstrate the subtle but remarkable shift in Nonconformist opinion in its attitude to the state. From being an instrument of oppression and religious discrimination, the apparatus of the state became the means by which Christian ethical ends might be achieved, even if in the long run there was disappointment in the effects the welfare state had in practice. At the same time, the disestablishment of the Church of England became an old man’s cause as the relationship of that church with Parliament shifted with the Enabling Act of 1919, and as ecumenical contact between the churches grew. The last major instance of organised anti-Anglican Erastianism was the campaign against the 1902 Education Act. If there is any criticism to made, it is at a structural level, as the thematic organisation of the book tends to obscure the chronological interaction of those themes, and there is some occasional repetitiveness. Many names also come and go; this reader, at least, would have welcomed a more detailed placing of these (mostly) men in their particular context, and to be reintroduced to them as they appear again. That said, Catterall’s book is a landmark in the history of the British churches in the interwar period, and will most likely remain a key starting point for scholars for some considerable time.